The Spectacular Photo Above Is Of Swale In The Winners' Circle after His Dominating Performance At The 1984 Kentucky Derby. He Was So Tall And Handsome, And So Cognizant And Proud Of His Great Victory. These Aspects And Qualities Are Very Apparent In This Excellent Photograpgh. If You Are kind Enough To order Grit And Valor: The Story Of Swale From Timothy J. Thompson Personally, He Will Send You A FREE 8 x 11 Laminated Copy Of This Photo With Your Order. This Photo Is So Magnificent, You Will Want To frame It! 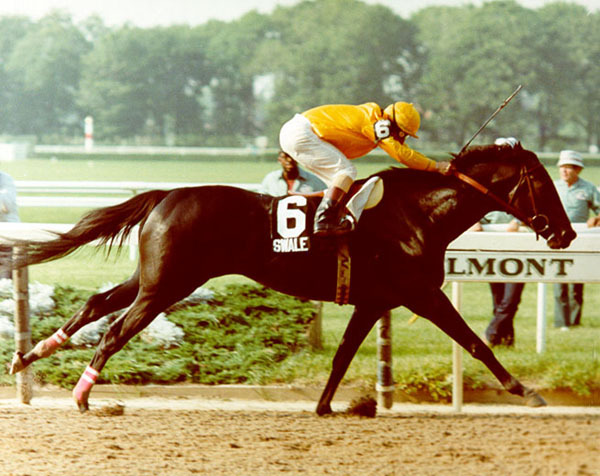 This Is Such A Magnificent Action Shot Of Swale Storming To Victory At The 1984 Belmont Stakes At Belmont Park In Elmont, New York On Saturday June 9. His Incredible Muscular Form Is Clearly Evident Here. If You Are Kind Enough To Order A Copy Of Grit And Valor: The Story Of Swale From Timothy J. Thompson Personally, He Will Also Send You A FREE 8 X 11 Laminated Copy Of This Photo With Your Order As Well.